In my quest to regularly get a good night’s sleep, I’ve made a lot of changes. I got a new bed with a new mattress, and I got new pillows that are much more comfortable and more supportive than my old ones. But I think the biggest impact was made by a little white box called the Adaptive Sound Technologies LectroFan Evo Sound Machine. This little machine 10 different fan sounds, 10 different white noise variations, and two different ocean sounds. They’re all non-looping so there are no breaks, and you can leave the sound of your choosing playing all night or you can set a timer. All of the little sounds in and around the house are drowned out, and I’ve been sleeping like a baby as a result. 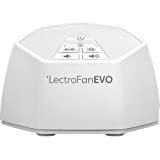 There’s no such thing as a sleep solution that works for everyone, but the LectroFan Evo works like a dream for me.